I've made the case that the shift of getting broadband speeds through our phones will change WWW from "World Wide Web" to "Whatever, Whenever, Wherever" because if we're into music, video, gaming, gambling, chatting, buying, trading, etc. we'll get access to whatever we want wherever and whenever. Neil Postman's title then comes immediately to mind, what's to stop us from "amusing ourselves to death?" This has been one of my soapboxes for a couple years - especially as it relates to children whom I believe are even more vulnerable than we are (because they know that getting what they want will make then happy ;-). Do the registration thing and start clicking on the "Stumble!" button. This little browser extension is like PopUrls, Delicious, MySpace, YouTube, Messenger, etc. rolled into one ridiculously easy and fun interface. Remember how cool Random URL was in the early days of the Web? Tripping over to some other country with the click of a button, not knowing what you'd come across. Now warp that early experience with the social networking and AJAX applications of Web 2.0. So I have to revise my use of Postman. We now face a greater threat to actually getting any work or learning done. We could spend the rest of our lives "intriguing ourselves to death." Let us know what you think. To whet your appetite, here are a couple sites I stumbled upon: Drawtoy and Transparent Screens. On my way to parent's weekend at my son's college, I pulled into a cute little town around noontime, and discovered the best homestyle cooking. I used a proven research technique for quickly finding a good restaurant in a new town; I asked a couple experts at the gas station on the corner. Both times I got the same answer. When I drove in I noticed a long line and thought "hmm that's a good sign". Social bookmarking tools such as del.icio.us and Furl allow students to use the same ‘proven’ techniques for their research assignments while also allowing teachers to redesign research assignments requiring higher levels of critical thinking (high on the list of 21st century skills) Instead of searching the “whole web” to find websites that contain “statistics about teens and alcohol”, searching FURL or del.ico.us brings you to a list of websites other users found worth bookmarking about the topic. Does that guarantee that a site that’s been bookmarked by 944 other users contains the information you’re looking for? Not anymore than the long line out the restaurant door guarantees a prime dining experience; but I’d be willing to bet that “people’s choice” provide me more useful results more often than “search engine optimization” results for many research projects. I can almost hear the MOANS… “great, not only do my students have an easier time plagiarizing because of the WWW, but now someone else can do their research for them?” But wait, working smarter might be the “hook’ to engage your students into using these tools, but the REAL reason I’d advocate using social bookmarking tools is that they allow teachers to redesign assignments in ways that require higher critical thinking skills. Following the advice of Alan November that teachers redesign the assignment, Vermont middle school teachers, Melissa Haberman and Deb McCarthy, have redesigned the research phase leading to their students creating of public service announcements on Teen Issues. By using “cut and paste” and the “notes” feature of del.icio.us along with the ability to TAG, these middle school stud ents are totally engaged by the ability to work ‘smarter’ and skip some of the tedium associated with traditional research methods. Meanwhile, teachers are clicking on the ‘tags’ with the students name and reading the “notes” sections to assess their students’ critical thinking skills in being able to include relevant data from each bookmarked websites that answers the “guiding question”. One student came back to class the next day and said “I installed del.cio.us at home last night; is it okay if I use it for other things besides this project, like can I bookmark websites about “puppies”. Thumbs up to these teachers for engaging their students with technology tools that require higher critical thinking skills; thumbs up to the students for transferring the skills to life outside the classroom. Athough ‘redesigning research” is one potential use of social bookmarking sites, the potential uses to these tool in education increases as each adds new features. (The Social Bookmarking FaceOff post on Read/Write/Web) Although I was surprised, that this review did not mention one of my favorite features of FURL as a research tool (the ability to export a selected list of sites in APA or MLA format). Do I hear another MOAN…”you mean my students don’t have to suffer through correctly punctuating their Works Cited page like I did ”… SIGH! Three years ago Steven Glyer, Director of Educational Technology at the Newport-Mesa Unified School District in California, introduced me to a document called enGauge: 21st Century Skills for 21st Century Learners. The framework presented by NCREL and the Metiri Group includes Digital Age Literacies, Inventive Thinking, Effective Communication, and High Productivity. Each of these sections include elements you would expect, but there are a few surprises I find important. For instance, there are eight Digital-Age Literacies, which include multicultural literacy and global awareness. Also, within the area of inventive thinking, we find my favorite 21st century skill, risk taking. (Teachers often ask me how to teach risk taking, and I think that is another post, but I'm certain it requires a learning environment in which it is ok to fail - and to learn from failure.) Under Effective Communication you'll find sections on personal, social, and civic responsibility. And the most significant element under High Productivity is the ability to produce relevant products. My perspective on all of these skills was changed about a year ago when Clark Aldrich (author of Simulations and the Future of Learning and Learn By Doing) remarked as I interviewed him that these are more than just 21st century skills... they might be called life skills (except for the potentially negative connotations) or success skills - and they have been the skills of the successful for centuries, at least. Some of these skills, though, are changing in the 21st century, particularly information literacy. Students need to be able to make sense of the overwhelming amount of information available today, particularly on the web. In fact, I thought I would use this topic to illustrate some of the search tools that can help make sense of the "infinite world of information" that is at our fingertips. A quick web search reveals that the enGauge document is not the top hit. An organization called the Partnership for 21st Century Skills at www.21stcenturyskills.org shows up first. They may have a better URL, but their site is much harder to navigate. Still, with a little digging I turned up this alternative framework of 21st Century skills. Recent news on the subject is equally easy to come by. A news search reveals, among other things, an article from September 25th titled Partnership for 21st Century Skills Calls for Innovative NCLB Reauthorization. Note that adding quotes to this news search focuses the results even further. Of course, if you are interested in what people are saying informally about 21st century skills, you can search online groups, which reveals many people with questions (and perhaps answers) about this topic - or better yet, do a blog search. In this case, we discover a relevant post at one of my trusted sources, Jeff Utecht's The Thinking Stick. And if other media than text interests you, there is always an image search, from which I located the image for this post, or a video search, which brings us to a video in which you can listen to a "Nppissing University Instructor discuss technology in learning and how Nortel LearniT helps his pre-service teachers develop their 21st century learning skills." Whatever your learning style, there is information out there for you. I even tried a map search, which made me curious about the connection between the Partnership for 21st Century Skills in Tucson, Arizona and this office in New York. This is only scratching the surface of the research process of course, but my fellow ITM bloggers and I will be returning to these tools often I'm sure. Meanwhile, these links can get anyone started in their own exploration of 21st Century Skills and what they mean to you and your students. Mark Prensky is relatively well known in educational technology circles for his 2001 article, "Digital Natives, Digital Immigrants." (PDF) The vocabulary of referring to younger people as "the digital natives" for whom technology use comes more naturally and "the immigrants" to the digital landscape who comprise most of the adult population and teaching cadre in our schools and universities can be helpful in understanding the divides which often separate and define generations of learners. The Natives: Students who have and are growing up in the digital age, who assimilate digital tools and methods for communication as easily as they breathe. The Immigrants: The older adults in society (and in our schools) who did not grow up with digital technology tools, but are working to "learn the language" and communicate effectively with the natives all around them. Some of the immigrants are open and accepting of "native ways," but many are resistant to change. The Refugees: The older adults in society who have chosen to flee rather than integrate into the native culture. Digital refugees often feel lost in a threatening and dangerous environment, and perceive themselves to be homeless. They have chosen to flee rather than remain immigrants, and may actively work against the goals and interests of both the digital natives and the digital immigrants. The refugees are primarily motivated by fear and a staunch desire to not only resist change but actively oppose it, deny the existence of a changed environment, and/or ignore it. The Bridges: The digital bridges are neither truly natives nor fully digital immigrants. Similar to millenials who have one foot in each century, the bridges have both native and immigrant traits. As a result, digital bridges are able to communicate relatively effectively with both groups. The Undecided: These people have not made up their mind which group they fit in, or which group they want to fit in. They are likely immigrants or refugees, but may not have taken sufficient action to reveal their identities and/or preferences for group identity. Do you know any "digital refugees?" 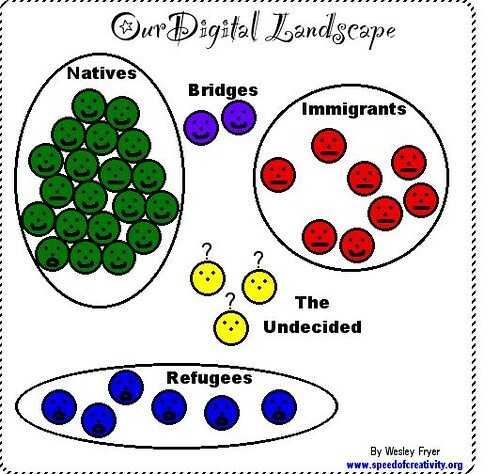 I think many of the educators and leaders we term "laggards" may fit into this "digital refugee" camp more than they fit into the "digital immigrant" group. I do think their status in either of these two groups IS a choice. David Warlick has challenged us to "stop acting like immigrants, and start acting like natives." What, however, are we supposed to do with the digital refugees in our midst- especially when they may comprise our school boards and many on our district administrative teams? What do you think? Live from Bloomington, Minnesota… I am posting this while waiting for a session to begin at an assistive technology conference called Closing the Gap. In coming weeks, I plan to expand on my Jumping In post by adding thoughts on why technology has compelling implications for education. Right now, however, I would like to start a discussion on education conferences as I am in the midst of one. Not only am I attending this conference for the first time, but I am co-presenting two workshops for Apple with fellow Apple Distinguished Educator, Kris Hill. I am also here to educate myself because I work with a few kids with learning differences, and I am the parent of a child with a mild learning disability. Closing the Gap is one of the nation’s first assistive technology conferences, started by parents of a deaf student in 1983. It was billed to me as conference full of tech savvy educators passionate about their niche in our profession. It’s a whole new world to me as I do not have a special education orientation. I am amazed as I walk through the exhibition hall at the variety of software and devices available for today’s students. The sessions have I attended have carefully crafted program descriptions, handouts which are always beloved by attendees, and detailed presentations. Overall, it’s a well organized conference with high expectations for all involved. Kris and I had dinner last night with another ADE Gayle Berthiaume who lives here in MinneSOHTA and she told us about another concurrent conference that sounds interesting. Sponsored by Education Minnesota, the state teachers’ union resulting from the merger of state NEA and AFT chapters, their Professional Conference is free and open to the public. Teachers in this state seem to have these two days off in order to attend. I have never heard of another state doing something like this and to me, it speaks volumes about how Minnesota values professional development. -What education conferences do you attend, if any? -What makes a conference a worthwhile experience for you? -Are your schools supportive of you attending conferences? And if not, what can be done to help teachers have this kind of opportunity? Leave your thoughts in the comments section above! ITM #2 dives into the world of language arts with some great web resources and instructional strategies. Pour yourself a cold glass of milk and enjoy! The History is Elementary blog is great resource for practical ideas on teaching history, especially in elementary school. The Shake and Bake post is particularly inspired, providing great ideas for hooking kids on Shakespeare by introducing them to the mystery of his identity. Type in "Answer to life the Universe and everything" on the Google search bar and click "I'm Feeling Lucky". Hint: It's an obscure literary reference to a famous science fiction novel. If you want to cut right to the chase, check out this entry in Wikipedia. The Gmaps Pedometer is a FREE web tool that measures and records walking distances from one point to another. It even measures changes in elevation! Use this tool with kids to help measure the exact distance between two points or to monitor your exercise path. FYI - Although Gmaps Pedometer uses Google Maps to help make it work, the website is not affiliated with Google in any way. 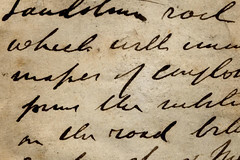 Ken Stein's Teacher Blog is a "sandbox" for ideas and resources related to teaching writing. It's just one of many great resources provided by the New York City Writing Project. His post on "Things to do with Writely" has 10 specific tips on how teachers and students can get the most from Writely (now called Google Docs) and other online word processors. Zoho Writer, AjaxWrite, and ThinkFree are a few other online tools to check out. Google Docs & Spreadsheets (formerly Writely) is a free web-based word processor and spreadsheet tool. Mike Lawrence is a former high school English teacher who currently serves as the Executive Director of Computer Using Educators. He visited Price Elementary School in Anaheim, CA for his "field trip" to see how they were using online word processors in their writing process. The Big 6 is an information and technology literacy model and curriculum developed by educators Mike Eisenberg and Bob Berkowitz. It is the most widely-known and widely-used approach to teaching information and technology skills in the world. On the main Big Six website, you can get lesson ideas, read about their evidence of success, and access grade appropriate tools. There are lots of FREE online dictionaries (Dictionary.com and Free Dictionary are two of the most popular), but you can also define words straight from the Google search bar. This simple tool allows you to quickly view multiple definitions of words and follow the link to the original source of that definition. Your Homework Assignment: Take one of the ideas or resources mentioned in this episode and use it in your school or classroom. Post your results to the comments section of this blog (see the blue "comments" link above) or send us an email. I interviewed Doc Searls recently, and he said that he likes to think of what he does as releasing ideas as "snowballs" to see if they gain momentum and strength as they roll down through the blogosphere. OK, so here's an Ed Tech "snowball." One of the intriguing elements of the "read/write" web is the opportunity that all students now actually have for their work to gain a wider audience and to truly contribute to the sum of public knowledge. Here is one idea to give them a taste of this truly remarkable change. 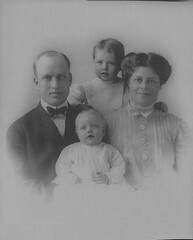 While it is unlikely that you're going to have a student who will unearth some new, significant information about Lincoln or Napoleon (although this may also happen), it is likely that all of your students could become the world-experts on their grandparents, great-grandparents, or other long-lost relatives. Those boxes of old family photos, newspaper clippings, and letters in their attics or closets or basements--combined with the power of wikis, blogs photo-sharing, and podcasting--give your student the chance to become primary-source historians. This isn't just important (and I think it is important, since this kind of a project can help students better understand their heritage and what history is, as well as actually providing valuable historical information), but it can be very exciting. I had an experience that convinced me of that. Some years ago I received an email from a woman asking if I had ever heard of a "Kate Hargadon" (my same last name), who had been the traveling companion of her grandmother on the Titanic. This intrigued me, so I searched the web to find that all the Titanic websites listed a young woman age 17, from Ballysodare, Co Sligo, Ireland, whose name was spelled "Kate Hagardon." This young woman boarded the Titanic at Queenstown and, sadly, died in the sinking of the ship. Because all of the members of the "Hargadon" family trace back to County Sligo in Ireland, it seemed possible to me that "Hagardon" was actually mis-transcribed from "Hargadon." I wrote the Irish Titanic Historical Society, who had someone look up the original passenger manifest, and found that "Kate Hargardon" was in fact "Kate Hargadon." They in turn informed all of the Titanic historical sites, and for many years every mention of "Kate Hargadon" carried a footnote acknowledging me as the "historian" who had discovered this. Now, I majored in history in college, but nothing I did in school compared with how exciting and fun it this little historical adventure was. Truth be told, it wasn't anything earth-shattering, but it had some small historical significance, and it was me being involved in history in a very real and tangible way. The read/write web now provides an opportunity for students to experience this same kind of excitement. Let me know what you think. Those of you in the US might remember a magazine that all dentists seemed to have in their waiting rooms: Highlights for Children. 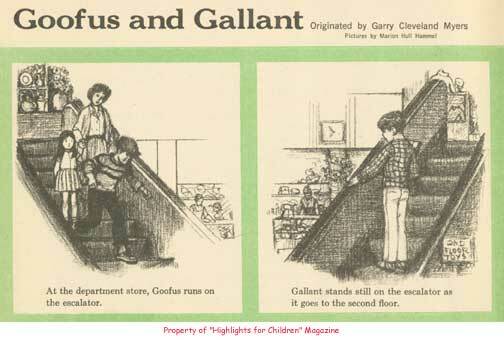 A popular feature of this was the Goofus and Gallant cartoon where two boys were used to illustrate basic good behavior ("At the department store, Goofus runs on the escalator" while "Gallant stands still on the escalator as it goes up to the second floor." - see the cartoon). a nerd who gets excited about learning. "Good on him," as we say down here in Australia. The son of a Bangladeshi father and German mother, Karim displays the quiet confidence and unshakeable values that make a true Gallant. As technology empowers learners, those who are self-motivated can achieve extraordinary dreams. One thing that most Gallants of 2006 have in common is that they take time out from their formal schooling to pursue these dreams. Isn't that interesting... I suggest that the opting out of formal education has more to do with assembly line learning approaches than it does with technologically impoverished learning environments. What do you think? Thanks for watching the premiere episode of the ITM! We know it was a long episode, but we just had so much to say. We promise to make them shorter in the future, and we hope to vary the topics more too. Please be patient as we figure out how to get the most from this great medium. And feel free to send us your ideas and comments! Textmapping is a graphic organizer technique that can be used to teach reading comprehension and writing skills, study skills, and course content. The Textmapping website has great examples, lesson plans, and email discussion groups. The Inertia video was created by Erica Eng when she was a Senior at Skyline High School in Oakland, CA. More examples of student produced media can be found at Listen Up! Hart Island is just outside New York City, NY. You can get historical information here and look at the detailed satellite images here. The new Google Educators website has lots of resources to help K-12 educators get the most from Google's FREE tools. Hall Davidson runs the CA Student Multimedia Festival, and he works for the Discovery Educator Network. He is a board member of Computer Using Educators, and he is a popular speaker at education conferences. He visited Franklin Elementary School in Hollywood, CA for his "field trip." Google Earth is free to download and use. The Jane Goodall Institute is a global nonprofit that empowers people to make a difference for all living things. Jane Goodall has dedicated most of her life to the study and preservation of chimpanzees in Tanzania. The virtual tour of her work can be downloaded here for use in Google Earth. Learn more about the educational uses of Google Earth at the Juicy Geography website. A "mashup" is when you combine two or more technologies or media products together to create something even better. Learn more about mashups on Wikipedia or see some great mashups that use Google maps at Google Maps Mania. Get the World War II "Places, Battles, and Special Ops" placemark to use in Google Earth. Check out Wikipedia's full entries for World War II. Chris Craft teaches Spanish and Latin to sixth graders at Crossroads Middle School in Columbia, South Carolina. Having worked in technology-related jobs before becoming a teacher, Chris has actively sought to integrate computers into his classroom. He has his Spanish students using wikis (JotSpot and WetPaint) to explore the topic of immigration, and has set up a blog for each of his students using the Open Source program Drupal--which has allowed him a more tightly controlled environment for blogging. Chris uses computers which were "resurrected from the trash heap." His only requirement was that they could connect to the Internet and run the Firefox web browser. His oldest machines he keeps running by installing the Linux operating system distribution Xubuntu. He applied early on to what is now Google Apps for Education and made sure each student had a Gmail account. His goal was to take his students from being "consumers" of Internet content to being "contributors," and to truly engage them. When his students realized that there was an "audience" for their work, even just the audience of other students in the school, the quality of their work "absolutely skyrocketed." They went from "turning their work in" to "publishing it." One really fun project he has them do in Spanish class is to have the students work in teams to create a "radio commercial" on why it is important to learn another language. By using the Free and Open Source program Audacity for recording and editing, which even runs on an old computer with 64 MB of RAM, the students can put in special effects (like echoing) in the commercials. I asked Chris how the parents have reacted to his students active use of Internet technologies in class. He said that his kids had been talking so much about how much fun they were having in class with these technologies that his classroom was "standing-room only" for the school's open house--while other teachers later lamented how few parents had attend their classrooms. He walked his parents through the online privacy issues, and made sure that everyone was comfortable with what he was doing. He also showed them how to access his class blog, and taught the parents what an RSS feed is so that they could easily keep up with what was going on in class. Listen to Chris talk more about his experience with me in EdTechLive.com's "Take 5." I was inspired today during Global Learn Day by the presentation of Stephen Downes, who observed that our current elearning environment is more a place where where we come together to collaboratively create and share content, rather than a place where people merely consume content in a traditional, passive way. I certainly think of the ITM blog in this way, and hope you will too! Your participation in this dialog is both invited and essential! One of the most challenging characteristics of our current K-12 educational environment is the emphasis on scripted teaching from many quarters. For a variety of reasons, many people seem to be advancing a vision of teaching and learning where the teacher is provided with a "script" of things to say and do in the classroom, and s/he is expected to essentially "perform on cue." I know Phil Schlechty has written about the importance of teachers viewing themselves as designers of engaging learning environments, rather than mere PERFORMERS and DELIVERERS of the curriculum. I definitely understand the need and vital importance of a robust curriculum, and I also understand (and appreciate from my own experiences when I was just starting out in the classroom) the importance of more scripted lesson plan ideas for novice teachers. I take issue with a vision of teaching and learning, however, that assumes the best teaching and learning environments will be the planned and scripted ones. I have found in my own teaching and learning experiences that often the most significant, valuable, and memorable learning moments were not planned. As teachers grow in their experiences and skill sets as instructional leaders, I think we both need and deserve more instructional autonomy. Only by providing teachers with more autonomy, and fewer mandates, can we hope that teachers will broadly be empowered to truly differentiate learning for students. Whatever the politicians decide, the good news is that teachers still make important choices each day about how they invite students to join them in the learning process. It's my hope ITM will help you find new ideas to create for, engage with, and motivate your students to new heights of learning! This is my first blog post ever - yes Lucy, I’m "jumping in." One of my favorite topics is how simple innovations in digital formats for information give students new options. In this post, I'll look at how digital audio can help students who struggle with traditional print, and can give all students new ways to tell their stories. Like music, one can download spoken books, poetry and other text from the Internet. When teachers and students use tools and collaborate to play and produce spoken material, they can create a powerful learning environment. Inclusive classrooms use text in audio form. Books on tape and CD have been popular for many years. Listening to the beginning chapters of a book can motivate readers or help them choose a book they'd want to read. Having the spoken text available can scaffold readers as they progress through the book. Narrated stories and picture books can be found on web sites like Bookhive. Librarians are using audio titles to support English learners in projects like the Earphone English project at Berkeley High in California. Also, in some places like the Grandview Library, podcasts provide digital versions of their texts. Students can participate and share their love of literature with others by reading aloud to different audiences. There are many class projects where students work with students in another class, preferably at a younger grade level, to select books, poems, or stories to record for audio CDs and/or as a podcast. A large-scale collaboration based on these ideas can be found at Librivox.org. Librivox is a new source of audio books, built one chapter a time by volunteers, who read public domain books out loud to make mp3 files that are cataloged on the site. Based on a wiki, it is an open facility with a voluntary quality review process, rather like wikipedia, with hopes to accumulate a good fraction of the vast public domain bookshelf. The Librivox approach fills an important niche. While there are text-to-speech conversion programs available today, a natural voice can be a real help for long passages like book chapters. Whole chapters are ready for download, so they can be distributed to students on CDs or in mp3 players for use away from the computer. And while there are fee-based audio books, free sources are often helpful when funds are tight, or when a teacher wants to experiment with a new approach. Librivox might have been possible earlier, but new technology (wikis, mp3 recording, etc.) has made it more practical. Best of all, it's embedded in a web site that offers a service, so busy teachers don't have to understand a lot of new technology to put it to use. It was almost 10 years ago that a group of Vermont students discovered the power of the World Wide Web to provide an authentic audience for their student work. Our rural community had just joined the ranks of those with local access to the Internet. Prior to that, access was available only to those who could afford a long distance call to an AOL or CompuServe number. While exploring this new medium, we stumbled across forward-thinking educators from The Global Schoolhouse, who encouraged students from all over the world to harness the power of the web by publishing stories of their communities as part of an International Cyberfair. Energized and excited by the power and potential of web publishing with students, I quickly organized my students to produce their first Cyberfair project. We had to work quickly; the project deadline was less than a month away. Within weeks, the students from North Country Union High School published their first web site about the beauty of their Vermont community affectionately known as the Northeast Kingdom. A few days later the following email from Seattle, Washington appeared in our inbox. The students quickly ran down to the school library and dusted off the 1978 Falcon yearbook. One student’s initials matched the letters TKD. After a brief inquiry, we were able to locate a Virginia phone number for Mr. Todd Durkee. He seemed a bit puzzled when we asked him if he had ever lost his class ring, but answered “yes… I lost it cliff diving in Hawaii”. We asked his permission to pass his phone number to a man who may have found his ring. Not only did Mr. Durkee get his class ring back, but the two men found several other connection, including having served on the same naval ship. Meanwhile, we started a small classroom geography activity exploring theories of how the ring might have traveled from Hawaii to the Philippines. But mostly, we were so thrilled that our student project was not only read outside our classroom, but had actually reunited a man from the Northeast Kingdom with a long lost treasure. We named our Cyberfair project that year "Kingdom Treasures." For the past ten years, the Internet has provided an authentic audience for our student work. I look forward to exploring the infinite power of the web to expand thinking by connecting people, places, and ideas. How about some links on Global Warming? or World War I? or even Web 2.0? Each of the above lists was found in less than one minute. Are they the best links known to the universe on their topics? Are they totally free from Link Rot? Are they absolutely "spot-on" for your students' reading level? Of course not, not, not. But as one busy educator to another, wouldn't you rather get a hand from a mate than start from scratch? Go ahead, try it yourself, use the text field below to type in a search term, then hit enter/return. (hint: the more basic, less boolean the keywords, the better). How did you go? To best succeed, look for files larger than 4 KB and with a fairly recent timestamp. Hotlists are lists of links whereas WebQuests and Samplers are Web-based learning activities. My experience is that Filamentality is a good first place to go to quickly find links because another educator has already put in time compiling them. If I'm gathering links for a WebQuest, then I'll spend more time to get really great sites - ones that have that "only on the Web" quality. But in the day-to-day of classroom / library learning, sometimes just getting students pointed in the right direction is a help. See what you think. A colleague of mine recently asked me about age appropriateness when using PowerPoint for classroom projects. I initially answered that fourth grade was age appropriate, but went on to elaborate on the effective uses of slideware versus its sometimes meaningless implementation. During this conversation, it occurred to me that my personal philosophy regarding effective technology integration has really evolved over the past few years. It was not too long ago that I actually had students creating book reports in PowerPoint. I cringe when I think about the lack of creativity I brought to that assignment! My point here is that there is a definite process in learning how to integrate technology meaningfully. I believe teachers must take the plunge and try to enhance curriculum and their own productivity with technology tools. At first, it can be a painful and time consuming process, but hopefully these experiences will give teachers motivation to improve. We need to reassure our colleagues that it is perfectly okay to be innovative in their classrooms, and that part of their own learning process involves stumbling in the classroom occasionally. That’s how we improve instruction for our students; technology-based projects can and should evolve with thought and experience. For example, I have been in my current position as a computer science instructor for the past six years. My first fifth grade class created a HyperStudio project called All About Me, based on an idea originally found in a published book on HyperStudio. Kids created five cards including a title card and ones labeled Hear Me, See Me, Watch Me, and More About Me. They designed and decorated each card, added some text, recorded their voices within HyperStudio, and included a digital photo and video of themselves that I had shot. It was a fun project, but not as rich and personal as I would have hoped. This project has changed over time because I’ve found ways to make it flow better. This year, my students will either use a photo I’ve taken or a photo they created themselves using Apple’s built-in iSight cameras and Photobooth software. They will also draw a portrait of themselves using Art Rage 2, record an audio file in Garageband, and make a movie entirely themselves using iMovie. Finally, these digitized items will be displayed in a slideware program called eZedia MX. My students own these projects now and I can’t say with confidence that my students six years ago felt the same. This project has improved over time because I’ve given kids more control over the process and more choices regarding content. I’ve also learned to organize and scaffold the process over time. I hope that we can elaborate on and share ideas such as this here in the Infinite Thinking Machine. I look forward to learning from ITM readers and bloggers! Many educators I work with are interested in ways technology can be used to support their professional learning community. DuFour and Eakers (1998) stress the importance of using class time for learning (p. 224), and the importance of smooth and efficient routines (p. 225). One strategy that can decrease the time teachers spend on mundane tasks and reduce the loss of instructional time is to use a shared online calendar system such as Lotus Notes or Microsoft Exchange (if your district provides such a system) or a free web-based calendaring system such as Google Calendar. When I asked Andy about the benefits he sees in using an online calendar, he suggested that it can be accessed from any location, it reduces paper load, it's editable by several people (such as administrators, school secretaries, and the librarian), and it's always updated whenever anyone looks. He also found the efficient flow of information to have an indirect impact on instruction... in short, teachers have more time for other things. In addition, he found Google Calendar in particular to be user friendly and easy for the staff to use. As for more instructional uses of such a tool, Andy and I discussed the potential benefits for team teaching (in fact, physics teachers at Laguna Beach High School are using Google Calendar for common curriculum planning). We also brainstormed ways it could be used as a class calendar, including homework assignments and due dates -perhaps including notes and resources related to these events. Students could even use an online calendar for their projects - anything from this day in history, to historical reenactments or speculative timelines. And I've always been a fan of helping students develop personal time management skills using real world tools such as handhelds; now, even without a handheld, a student can access their online calendar at home or at school. Online calendars were not the first tool I thought I'd be writing about here on the Infinite Thinking Machine, but it sure got my brain working this morning. I hope that some of you will find my chat with Andy Crisp inspiring, too.